Glen Raven recently introduced its Caravan collection of Sunbrella® fabrics, representing the company’s latest collaboration with renowned designer Richard Frinier (pictured, upper left). 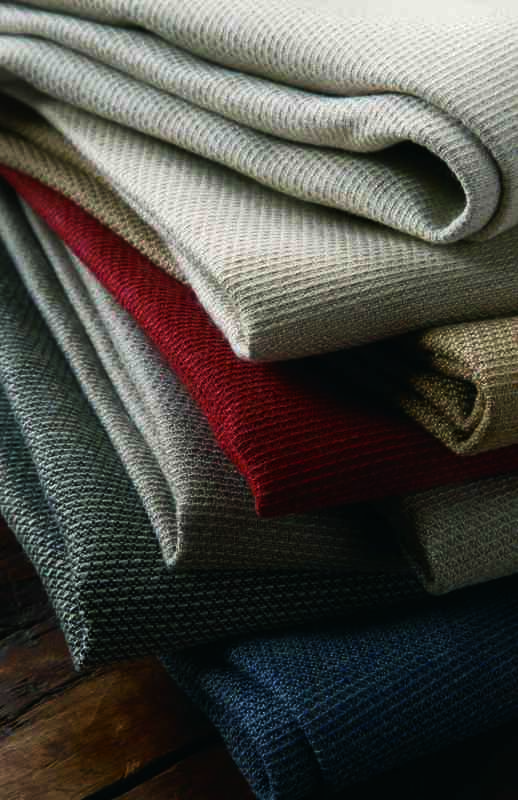 The fabrics are easy to incorporate into living spaces with modern, transitional, and traditional styles, as well as into residential or hospitality environments. The Caravan collection is currently available through interior- and exterior-furnishings manufacturers. It includes two new base-cloth constructions (Sahara and Desert) and five decorative and coordinating patterns (Casbah, Bazaar, Berber, Medina, and Nomadic), each presented in authentic color palettes to create distinctive living spaces. Patio & Hearth Products Report recently sat down with Frinier to learn more about the inspiration behind these lovely fabrics. How did your travels to Morocco lead to your development of the Caravan collection? Frinier: My first trip to Morocco was in June 1967. I traveled alone, on a motorcycle, from London that summer, and I spent two very amazing weeks in what was, for me, my most exotic and memorable cultural experience and adventure. Tangiers, Casablanca, Fez, Meknès, and Marrakech each had unique architecture and character. The edge of the Sahara and the deserted coastline were scenes from another era. Caravan from the Richard Frinier collection for Sunbrella®. When I ran low on gas, I pulled off the road into a small village. It seemed that all activities stopped, and I was surrounded by curious villagers as if I had just arrived from the future. When I unscrewed my gas cap and gestured that I wanted to buy some gas, a can appeared. They waved and cheered as I revved the engine and rode on my way. What makes Moroccan designs different from those of other countries, in terms of their outdoor-living applications? 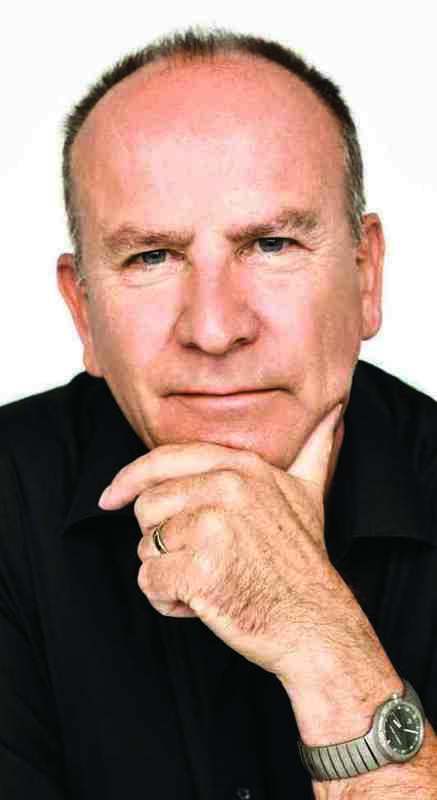 Frinier: In Marrakech, I stayed at the Grand Hotel, across from the Grand Plaza, in the heart of the city. The rooms had no air conditioning; rather, the walls of each room stopped short of the ceiling, where fans circulated the air. Even in June, few went outside, as the daytime temperatures are above 100 degrees. Fabric awnings and umbrellas on rooftop terraces and the water fountains in the courtyards cool many residences in the city, but it is at night that life in the city comes alive. What makes the Caravan collection unique? Frinier: The Caravan collection takes its name from the camel trains that were still crossing the Sahara during my first journey to Morocco. These exotic trade routes and the nomadic life of the Bedouin tribes led to my inspiration to create this collection. My focus, in this collection, was to reinterpret the handloomed textiles woven over the past century by the Beni Ourain tribes of nomadic sheep herders. Wool from their sheep is left natural. Wool from the black and brown sheep creates a contrast to the predominantly unbleached white fiber. These nomadic tribes (who live on the eastern slopes of the Atlas mountains) weave textiles that are almost primitive in pattern, in contrast to the bold geometrics and bright colors typically woven in Fez. 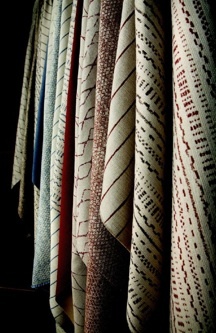 More samples of Caravan from the Richard Frinier collection for Sunbrella®. What makes the Caravan collection suitable for outdoor home and hospitality use? Frinier: I believe the textural constructions, ethnic patterns, and tonal colorways are unique and add timeless and authentic styling—for both residential and hospitality environments. The fabrics have a vintage appeal, gently irregular and perfectly imperfect by design. The crafting of the original, handmade Beni Ourain tribal rugs has been passed along for generations; the rugs were popularized by Le Corbusier (Charles-Edouard Jeanneret-Gris, 1887–1965) during the Midcentury Modern architectural movement. Architects and designers are on the lookout for a touch of the exotic. Accent pillows, ottomans, and upholstery provide the perfect effect to incorporate personality into interior and exterior design environments. Why was Glen Raven/Sunbrella the appropriate textile manufacturer for your collaboration on Moroccan-inspired designs? Frinier: I have been working with Glen Raven’s Sunbrella brand for nearly three decades, and there is no finer weaver of performance fabric than Glen Raven. Aside from the authentic design motifs, textures, and colorways we were able to achieve, the durability, fade resistance, and cleanability of Sunbrella textiles is second to none. The company is simply the best at what it does. How can these fabrics can be used in outdoor settings? Frinier: In addition to being used for upholstery, pillows, and poufs, fabrics in the Caravan collection can enhance the outdoor room with drapery, curtains, awnings, and umbrella textiles. Patterns from this collection can be sewn into tablecloths and slipcovers. Sunbrella fabrics are perfect for indoor applications, too, as they make everyday-living items much easier to keep clean. What plans are there for your Moroccan designs? Frinier: The Caravan collection is currently being presented to Sunbrella’s customers. Depending on the success of the collection, more colors and additional patterns will follow. As for my interest in Moroccan crafts, I have designed collections for Dedon inspired by my adventures in Morocco, including its now classic Daydream daybed and its Marrakesh collection; both continue to be available to the trade. In the future, there will always be a place to show my affection and inspiration, reminding me of my travels in Morocco. Being there is such a sensate experience that it really never leaves—so I can say that from time to time, the essence of my travel experiences in Morocco will appear in certain design details, when the spirit moves me or the design calls for such a unique and romantic character.